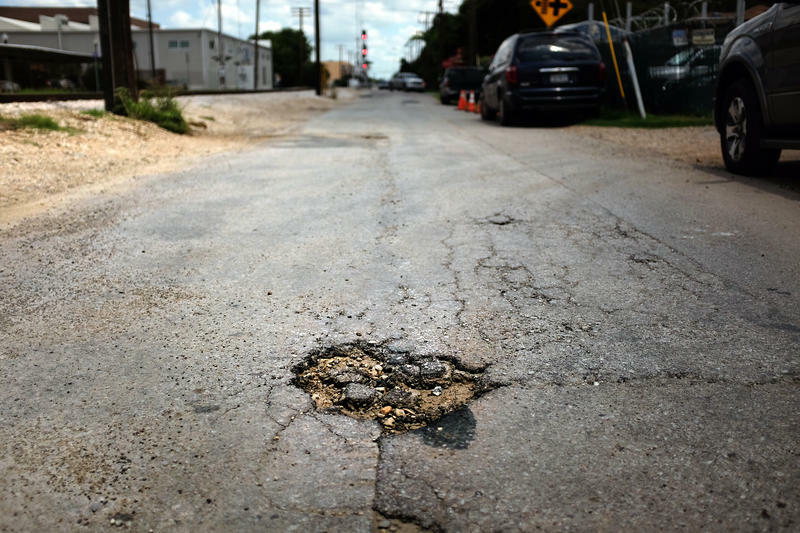 Cyclists and motorists beware: The amount of potholes on Austin's roads has nearly doubled, thanks to all the rain, and the traffic. As massive amounts of rain have fallen on Austin, the number of potholes has gone way up, nearly doubling. But Austin’s Public Works Department says as long as they know about them, they can fix them. And fairly quickly. “We have a performance measure by which we track the response time to go out there and address that pothole repair. One is within 24 hours and the other is within 48 hours," says city engineer David Magana. He says that if a pothole is deemed hazardous (a pothole that could impact driving), it gets fixed within 24 hours. If it’s not hazardous, it gets fixed within 48. A review of Public Works records by KUT shows that the promised response time of 24-48 hours turns out to be pretty accurate. And they're busier than ever. Last October, for instance, the city had 106 potholes they responded to that month. This May, they fixed 526 of them. Magana also says after the city launched a 311 mobile app, they started to see more potholes being reported. But on top of that, the intense rains have meant much bumpier roads this year. The city says if you see a pothole, give them a call at 311 or use the 311 app, or call Public Works directly at 512-974-8777. And Magana cautions against a trend that's starting to pop up in other cities, "pothole gardening," where flowers are temporarily planted in a pothole, usually after citizens become fed up waiting for them to be fixed by the city. "I wish people wouldn't do that, because it puts them in a position of being hit by a vehicle, obviously," Magana says. "We would encourage that they call or use the phone app for it to be repaired." Below is a map of service requests filed to Austin's Public Works Department from the beginning of the year through June 22. Five-hundred seventy of the 2,161 requests this year, just over a quarter, were filed last month, the wettest May on record. Central Texas just had one of its wettest Mays on record. The heavy rainfall, storms and flooding became deadly and destructive, causing 23 deaths. Crews continue to search for those who are still missing in Hays County, where storms and flooding destroyed homes and property of many residents. President Obama gave Texas a federal disaster declaration Saturday, allowing affected counties access to federal aid for relief efforts. The community in Wimberley is finding some sort of normalcy after record flooding over the weekend. Seven homes there were destroyed, and 1,400 were damaged. But even before the waters had receded, community members started looking for ways to help their neighbors. A steady flow of customers came into Brookshire Brothers, Wimberley's local supermarket, on Tuesday. Customers were buying extra water and groceries that supermarket employees would then pack up for neighbors in need. A sign-up sheet by the door encouraged residents to write down how they could help others. Some people offered their cars; others, their cell phones. 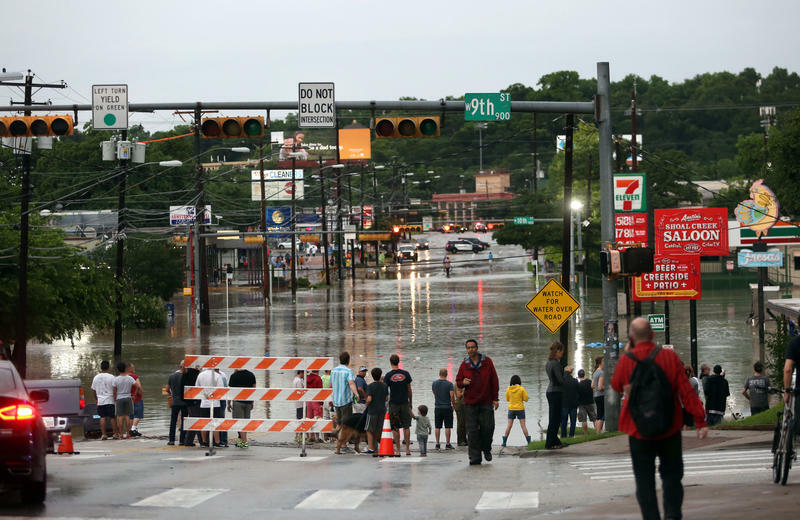 Storms swept through the Austin area Monday afternoon, causing businesses and roadways to flood. The National Weather Service says Austin should expect more rain and thunderstorms this week, with chances as high as 50 percent on Friday. 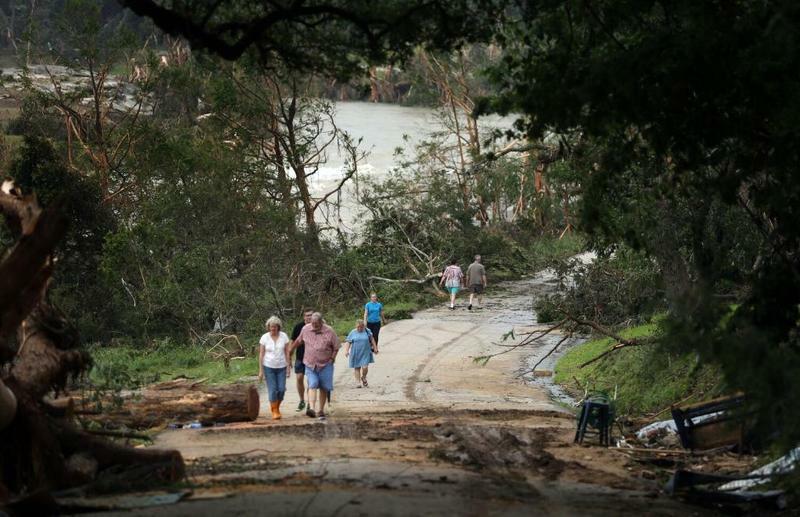 Storms across the state resulted in a total of seven dead in Texas, including one in San Marcos, one in Wimberley, one in Cameron, one in San Antonio and three more in Houston. At least 30 people are still unaccounted for in Hays County. Meanwhile in Austin, clean-up efforts are underway. You can get the latest information from the city of Austin here. 4 p.m. The body of one man, still unidentified, has been recovered in northeast Travis County. 1 p.m. CapMetro says its rail service will be restored as of 3:44 this afternoon. Its buses are running normally, say CapMetro officials. 12:45 p.m. You can call Austin Disaster Relief Network if you're affected by the flood and still need help. 10:45 a.m. ATXfloods is reporting that nearly all of Austin's roads are open.